New York Yankees legend Yogi Berra once said, "Love is the most important thing in the world. But baseball is pretty good, too." 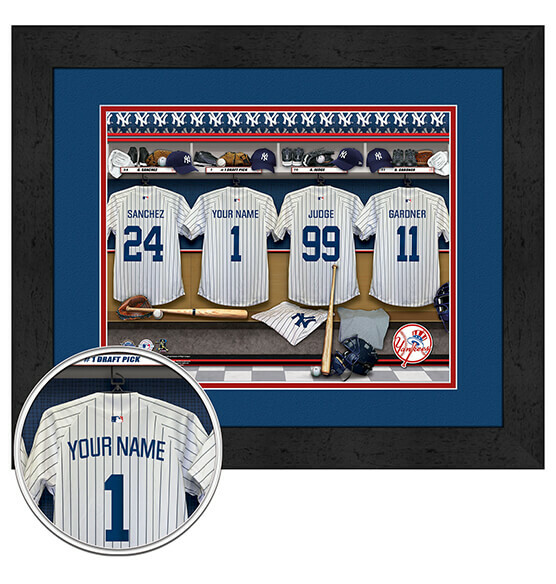 Join the ranks of Berra and other icons like Babe Ruth, Lou Gehrig, Joe DiMaggio and Mickey Mantle by customizing this premium New York Yankees Personalized Locker Room Framed Wall Print with your specified name up to 12 characters. Featuring a digital double mat in team colors, an elegant black frame and a full-color print behind glass, this special gift is guaranteed to thrill any Yanks fan. It comes ready to hang for drama-free decor that knocks your fan status out of the park.